Monday night the Borromeo String Quartet treated us to a seldom-heard Stravinsky quartet, a near-premier and an old favorite, all dedicated to the memory of Francesca Rullman, a long-time board member of the Cape Cod Chamber Music Society (CCMS), which presented the concert, and a dear friend of the Kitchens and the Borromeo. In honor of these memories the Quartet began the program with an arrangement of the Saint Anne Fugue from the conclusion of Bach’s third book of the art of keyboard playing. The performance was brief, intense, and moving. Igor Stravinsky’s Three Pieces for String Quartet (1914) is a short, enigmatic work in three movements,“Danse in Quatre études,” “Eccentrique in Quatre études,” and “Cantique in Quatre études.” The first movement is a peasant dance, 43 seconds of a simple repeating figure in G minor over a drone of D and E flat. One could easily imagine a room full of stomping dancers. The music is both crude and strangely beautiful – a glimpse of coming minimalism. The second movement begins with a series whines or groans created from six downward semitone glissandi with the tempo of a resting heartbeat, answered by five cheerful pizzicatos, only to be followed by groans again, interrupted this time by the pizzicatos. Questions and ambiguous answers follow. The conversation is fascinating and disturbing, but always intensely interesting. The movement ends with the conversation that began it, but the whines are in a higher register, and the answers more emphatic. The third movement opens with a simple melody moving up a D-minor scale to G, and then somewhat circuitously back to D. This melody, over dissonant harmonies, is repeated with small variations for more than four minutes. The movement is hauntingly beautiful and hard to get out of your mind, which is true of the entire piece. Very strange, very beautiful, and very well played. Nicholas Kitchen introduced the second performance of Daniel Brewbaker’s string quartet, commissioned by and written for Borromeo or the Borromeo, with a description of how it arose from deep friendships between the Quartet and many people associated with a music festival in the wine growing region of the Napa valley. Out of these friendships a score was created, the latest version of which arrived just in time for its first performance last week. So what we heard was hot off the (wine) press. And it was tasty; tonal, melodic, and often beautiful. There were four movements, all related to the personalities of friends of the composer and the quartet. Kitchen explained that the first movement, “chasing muses,” was in honor of Jon Shrem, a lover of classical mythology. The second, “painting sunflowers,” relates to Margaret Mondavi, a painter; the third,“tending roses,” is a love song to Maria Manetti, now Maria Manetti Shrem, a lover of plants. The last, “enjoying the view,” is a Buddhist view of the Napa earth. Just how many of which muses fit into the first movement is beyond me at first hearing – but there are certainly muses of music and dance. The music is rhythmic and mostly tonal but becomes more dissonant just before returning to the harmonies and melodies of the beginning. The second movement, by far the longest, begins with the fluttering of flowers or leaves – depicted very effectively with trills of thirds, fourths and fifths on all the instruments. (How you would paint this is anyone’s guess.) The motive comes back many times within the movement, which ends with a slow dissonant largo not dissimilar to the third of Stravinsky’s three pieces. The third movement, the love song, starts with two melodies weaving in and out between each other like a duet in a Bach cantata. The melodies are passed among the four instruments, while a steady pizzicato beat from one of them keeps the whole thing moving along. A middle section drops the pizzicato while all the instruments join in counterpoint. The pizzicatos begin again in a kind of da capo. This was easily my favorite movement. The fourth movement begins with a throbbing beat and danceable rhythms that recur periodically throughout, interrupted by slower passages. How it relates to the Napa valley or Buddhism is not clear to me, but the music is worth hearing again. The Borromeo performed the whole piece bravely if a bit raggedly, not surprising given how little time they have had to understand it. It will only get better – and probably more comprehensible to a listener — as they get to know and love it. The last piece on the program was Schubert’s masterful Quartet No. 14 in D minor, the “Death and the Maiden.” The piece invites controversy: What is one to make of the popular title? Is the second movement really about the struggle between a maiden and death, or is the melody on which the variations in the movement are based simply something pretty? I have heard the second movement played both ways – and usually prefer the former. Played slowly with little or no vibrato, the theme that starts the second movement variations can be absolutely chilling. But the Borromeo did something different. The enigma of the whole quartet begins in the first movement, which starts with a shout followed by quieter melody. The movement proceeds in the same way; passages of relative calm are interrupted by bursts of fury. What is the meaning of all this? Is a struggle happening in the first movement and not in the second? The Borromeo’s performance seemed to answer affirmatively. After the brief, rather sweet violin solo about 10 minutes into the first movement there are alterations between strong forte outbursts and rather plaintive sections of melody. The strong passages gallop along as if they were riding on horses. As the end of the movement approaches the key switches to minor, and the Borromeo’s playing became more and more ominous. The final phrase – played very softly and deliberately, was frightening. And the second movement opened not largo but moderato. To me the mood was “thank goodness the frightening stuff has passed.” The Death and the Maiden theme was just a melody, and a pretty one indeed. I looked at the program – the second movement is clearly marked “Andante con moto,” and that is just how it was being played. The first variation followed, light and cheerful as always. But not all the variations are light. Some echo or expand the fury of the first movement. Perhaps the fear or the danger has come back? Who knows. I found the interpretation and the performance engaging, although the long program and the demands of the new composition were beginning to tell. The wonderful thing about great music is that it can be – and should be – different every time you perform it and every time you hear it. The players are different people each time, and so are the listeners. About the venue: The Provincetown Art Association and Museum (PAAM) is a new and beautiful space, currently hosting a large show of Robert Motherwell. There are several galleries, the largest two holding up to 100 people. 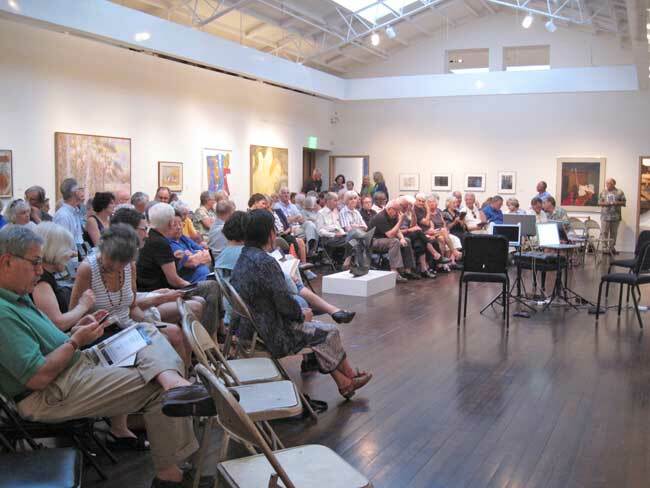 The concert was held in one of these, The Hans Hofmann Gallery. We were initially let into the other large gallery, all flat plaster and glass. I clapped my hands and estimated the reverberation time to be over 2.5 seconds. Fortunately, the Hoffman was designed for concerts as well as art, and the high peaked ceiling was filled with sound absorbing panels. The reverberation time with the nearly full house was about one second at the vocal formant frequencies, and somewhat less lower down. The seats were arranged in expanding half ellipses around the musicians, who occupied a space in the center of one of the long walls. This arrangement brought most listeners as close as possible to the music, although vision in the back rows was obscured. (A similar arrangement in Cotuit placed the musicians on a raised stage, greatly improving their visibility and audibility.) By coming early to this concert, I was able to get a seat only about 15 feet in front of the musicians. What a treat to hear the music almost exactly as the musicians hear it! The sound was clear enough but very loud – I would guess at least six decibels louder than the concert I heard a week ago at the Cotuit Center for the Arts, and more than six decibels louder than the one in Wellfleet Congregational Church last Friday. The loudness is partly due to being close, but mostly due to the parallel walls of the gallery. It is traditional to hang art on plain flat walls, but such surfaces trap sound and let it build up for a bit before finding its way to the absorbing panels on the ceiling. Acousticians try to avoid such surfaces. Clarity was substantially better in Cotuit because the wall behind the musicians was completely covered by thick curtains. I suspect the strong flutter echoes produced by the parallel walls reduced the clarity at some distance from the musicians, but the relatively low reverberation time might have prevented serious damage. I sat in one of the far seats during part of Nick Kitchen’s introduction to the concert and found the intelligibility adequate, but I think that was mostly because Kitchen knows how to project speech to an audience as well as he knows how to project music with his violin. In my seat during the concert the sound from all the instruments was good. Bogen is correct, there is no controversy at all about the title. The quartet derives its nickname from the Lied D.531 of the same name which Schubert set to a text by Matthias Claudius involving a dialogue between, well, Death, and a Maiden. Hardly a text (or a musical setting) that invites violent dramatic shifts. Curiously, though, Schubert omits the vocal line from the quartet, using the piano part alone for the theme and variations. So the nickname How or whether this has any link to the rest of the quartet is arguable. Beethoven’s Op. 132 string quartet has the great Heiliger Dankgesang movement, which draws inspiration from a convalescent’s illness, alternating between the convalescent’s chorale tune and more animated sections of “feeling new strength.” The opening movement of Schubert’s D.810 could be the dark-and-darker variation on this idea, alternating between lyrical convalescence and feeling violently much worse, and I suppose the final movement could be a version of the tarantella in which the convalescent dances himself to death. But you don’t have to superimpose a death-related program onto any of the other movements. Perhaps the commentators misunderstand David’s thoughts. He wasn’t doubting the source of the “Tod und Das Maedchen” theme, but rather speculating on whether it needed to be performed as a tragic meditation on death. When composers incorporate song themes into subsequent works, the song meanings are often entirely lost, obscured or altered. In his opus 13 quartet entitled “Ist es Wahr? (Is it True? ), Mendelssohn turns a song into a melancholic meditation. That the quartet also incorporates a theme from Beethoven’s opus 130 gives additional weight to the work, but the original song was a light popular ditty not a metaphysical treatise on the meaning of truth. Schubert used another of his own songs, “Trockne Blumen” as the subject for a set of variations for flute and piano. The original song is profoundly sad, but the flute variations are sprightly froth. I understood that, but I don’t see why it has to be so. The “Trout” Quintet has mostly bubbly, upbeat movements, but that doesn’t mean that all the movements need to be informed by “Die Forelle;” the “Trockne Blumen” variations as you mention don’t relate much to the song or the schoene Muellerin cycle from which it comes; the other three movements of the Wanderer Fantasy don’t relate to the song which serves as inspiration for the slow movement. It seems like for some reason there’s a tendency to read too much in programatically especially when you’re talking about something dark or minor-key (the rehashing of the old argument about whether DSCH’s tendentious relationship with the Soviet regime found its way into his music at https://classical-scene.com/2012/08/14/deneve-ma-bso/ is one example; the stories about Mozart writing his Requiem haunted by premonitions of his own death is another).